Contains: Ground Timothy Hay, Dried Parsley, Dehydrated Carrots, Carob Beans, Dehydrated Savoy Cabbage, Dehydrated Celery, Pine Cones, Dehydrated Leeks, Red Bell Peppers, Chopped Alfalfa Hay, Chopped Timothy Grass Hay, Dried Bay Leaves, Dried Calendula Flowers. Comes in a pack of 3. 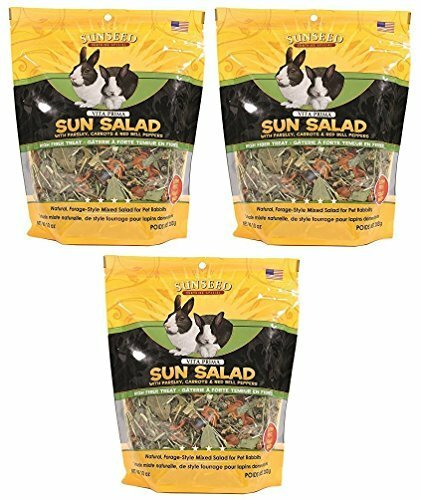 Natural, forage-style mixed salad for pet rabbits with parsley, carrots and red bell peppers. This natural, high fiber treat encourages active feeding behavior. Great way to treat your pet while supporting overall health and well being. Appropriate for pet rabbits in all life stages. If you have any questions about this product by Sun Seed, contact us by completing and submitting the form below. If you are looking for a specif part number, please include it with your message.